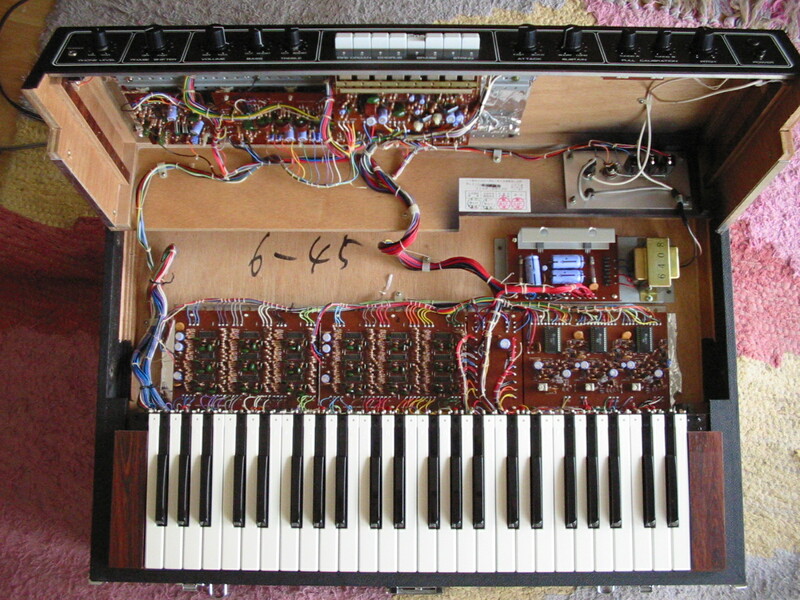 Often also named Poly Ensemble S or K-5 or even Poly Synthesizer (named so on the front page of the service manual). Why did Korg used so many different names is still a mystery to me. 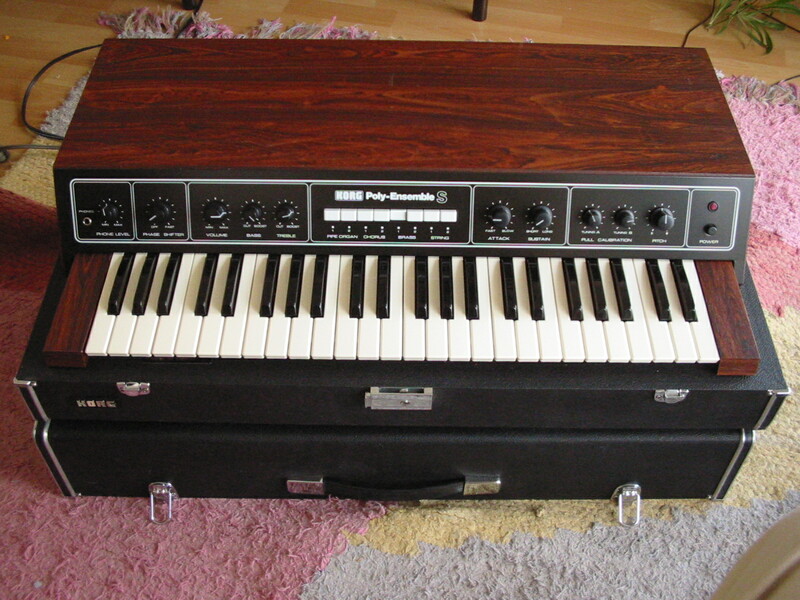 Built from 1976 to 1979/80 it is often mistaken as being a better or expanded version of the Korg PE-1000. But this is not like this! 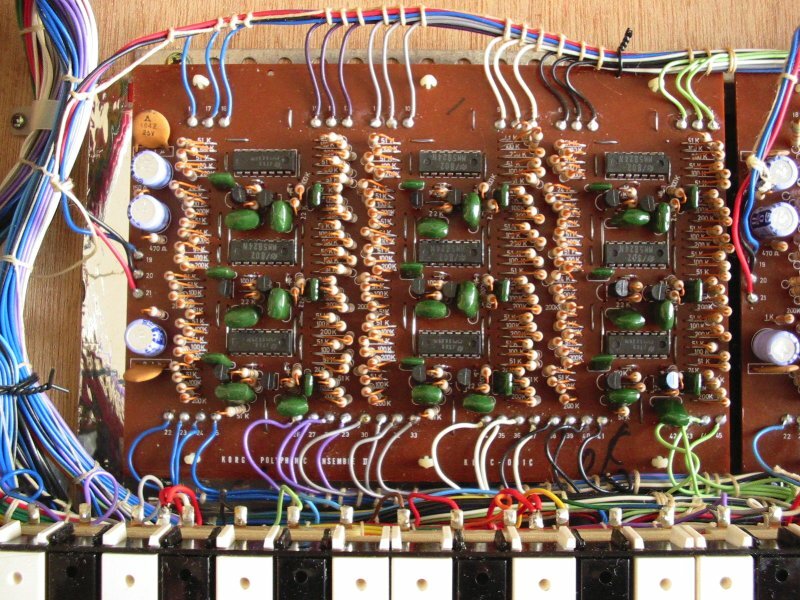 It is technically a grandfather of the 3 oscillator Korg Lambda. The PE-1000 got more keys and some nice added controlls like a variable vibrato. 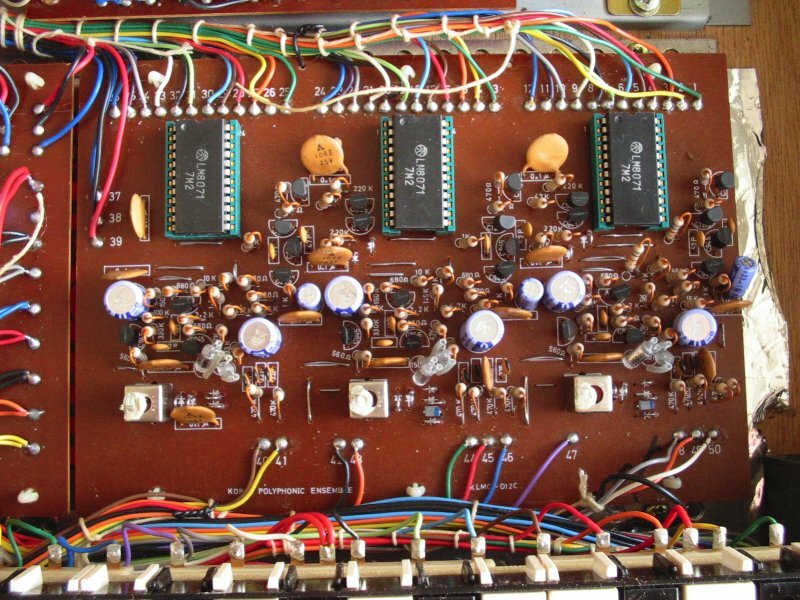 But the PE-1000 sounds very different due to the lack of the multiple oscillator design. Its main feature compared to nowadays keyboards is its full polyphonic structure. That is, each and every key will make a sound at the same time (if needed). No voice stealing on long release time notes. It is build like so many keyboards of this time in a suitcase like box with a detachable lid. Nice for live gigs. with its red little lamp is on the very right of the instrument. adjustes the master tune and allows to detune the second and third oscillator for a more fuller or animated sound. This is the very special part of this machine and the reason for sound very different from those many, many italian string machines from the same time. The PE-1000 is not build like this. So consider the PE-1000 as something ery different and not the little brother of this one. The added preset vibrato differs from preset to prest catagory. Ofcause no vibrato on the organ sounds. with Attack and the Release (named Decay) controls is typical for string machines from this time. The sustain is not endless, no matter what sound you try. But it holds long enough for normal musical playing. So this is not a minus. You can select one or two of the presets at the same time. But they have to be either #1 or #2 presets being selected together. features a little Bass and Treble EQ. A usefull addition! on this one (not included on other Korgs before this one) is a very nice addition to the sound. Only the phasers rate is variable. If one uses the straight dry output on one side of the stereo field and the output with the phaser for the other side, you get a nice stereo movement to the sound on slow phaser settings. If the phaser is shut-off (full counter-clock turning till it clicks), you get the same signal on both outputs. Ofcause there is also a Volume knob adjusting the overall volume. with extra adjustable volume is a nice welcome on a pro and a home keyboard. The sound is not as smooth as the Lambda, but way different them most other string machines. This is mainly because of the sound animation is not done by a preset ensemble unit. This time the manufacture used the hard way of adding movemnts to the sound: 3 oscillators. Of cause these are build in the organ like top-octave divider with divider chips to generate multiple ranges of keyboard octaves or different octaves being mixed. You can tell the year of the production of these string machines by the knobs being with a white scale on the early ones. The later, like mine, got the MS-20 like knobs. Earlier models also got "Reed" and "Wind" as the first two presets. While the changed this rather quick (?) to two organ presets.